Recently I have completed a study of the costs and benefits of extending a new portion of a $58 million bicycle rails to trails project into downtown Sarasota, Florida. Despite high costs, this project—an extension of the existing Legacy Trail—is conservatively estimated to have just over $195 million of benefits for Sarasota County. This is an economic net gain of over $137 million for the county. The conclusion is that this public outlay for bicycle infrastructure should have benefits for Sarasota County that are well worth the investments. In a previous post I elaborated on the benefits of the development of bicycle trails. To be sure where land acquisition is necessary the cost of the trail extension is high, but having seen the actual benefits of the existing Legacy Trail completed about 10 years ago, the county government is strongly in favor of the trail extension. The issue the county government faces is how to raise the necessary money to pay for the trail extension. In this post, I will summarize the results of this cost-benefit study of the Legacy Trail Extension into downtown Sarasota. 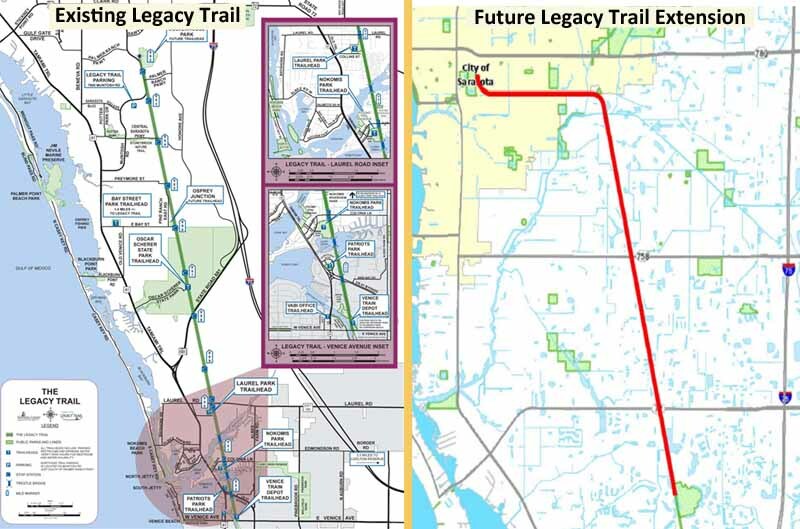 For those interested I am linking the full version of the report that has the title The Value of the Legacy Trail Extension for Sarasota, Florida. All the figures in the tables are discounted dollars, a typical method for comparing future cost and benefits. Later in the post I will provide an update on the progress made to fund the Legacy Trail Extension. But first, I give an overview of the nature of the trail extension followed by an assessment of the value of the new trail. The existing Legacy Trail in Sarasota, Florida is a 10-mile, high-quality pedestrian and bicycle corridor that runs from Venice to suburban Sarasota. This trail has road-quality pavement, rest stops called stations, and local vegetation on each side. It traverses several parks, allowing for easy access for both pedestrians and bicyclists. Recently, the Friends of the Legacy Trail have been promoting the extension of this trail from suburban to downtown Sarasota. Today the trail ends near Culverhouse Nature Park in Sarasota. 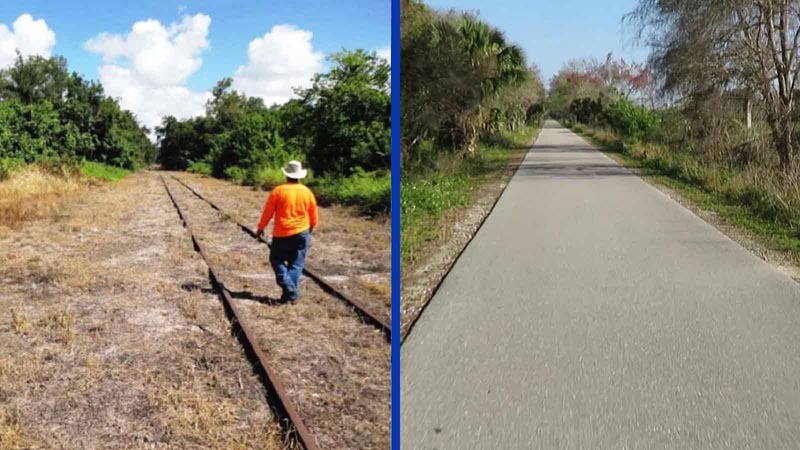 The railroad tracks are still intact running from Culverhouse Nature Park to downtown Sarasota for a total of more than 7 miles (figure 1). With the proposed new extension, the entire trail would run over 17 miles from an old restored train station in Venice, Florida all the way to Payne Park in downtown Sarasota (figure 2). The trail extension would also give Sarasota residents access to the North Port connector trail and the Venetian Waterway trail, which runs for about 5 miles on both sides of the Intracoastal Waterway from the train station in Venice (end of the Legacy Trail) to Casperson Beach. The undeveloped railroad corridor is an ideal location for a bicycle and pedestrian trail. The corridor is over 100 feet wide with few street crossings, and it traverses the center of the city of Sarasota. As a result, it can be developed into a linear recreational greenway trail. The trail is also located in a densely settled area, making it possible for many people to take advantage of new amenities in what is now an unused corridor. The trail extension could be used for commuting, along with recreational purposes, including walking, cycling, rollerblading, among other activities. The trail extension will also offer connections to jobs, shopping and entertainment districts, and safe routes to schools. The Legacy Trail Extension can potentially be the first step in transforming what is now a car-centered downtown Sarasota, where traffic has about reached its limit. This situation is not unique to the city of Sarasota. Due to pressure from cars, cities across the country are giving greater emphasis to alternate forms of transportation, including buses, mass transit, bicycling, and walking. The Legacy Trail Extension is an opportunity to turn an undeveloped corridor into a linear park, a pedestrian path, and bicycle trail with few road crossings that runs into downtown Sarasota. The costs of the trail extension is about 58 million dollars including the purchase price of the land owned by CSX. Given that the extension will be only 7 miles long, this is a rather large investment for a community to support (figure 3). Remarkably there is little local opposition to extending the trail. In meeting after meeting, the county board of commissions has voiced unanimous support for the trail extension. However, large investments in local infrastructure also require some assessment of the costs versus the benefits. This post highlights the fact that the benefits of the trail extension are well worth the costs. The existing Legacy Trail in Sarasota County is a 10-mile, high-quality pedestrian and bicycle corridor that runs from Venice to suburban Sarasota. The undeveloped railroad corridor—over 100 feet wide with few street crossings and traversing the center of Sarasota city—is an ideal location for the Legacy Trail Extension. As a result, the trail extension can be developed into a linear recreational greenway trail. The trail extension will be used for such recreational purposes as walking, bicycling, and rollerblading, and will also become an active transportation commuting corridor into downtown Sarasota. The main economic benefits of the Legacy Trail Extension will be an increase in property values surrounding the corridor and an increase in tourism (table 1). 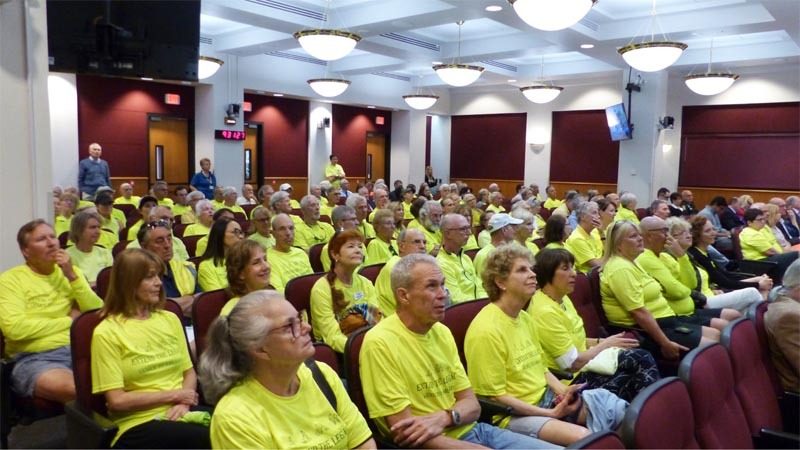 The rationale for measuring both increased real estate values and tourism is that the existing Legacy Trail attracts 175,500 riders and pedestrians from inside Sarasota County and 49,500 trail users from outside the county for a total of 225,000 users. The trail extension will result in increased demand in real estate near the trail, which is valued at $123 million over 30 years. Many of the trail users from outside the county are extended-stay tourists who are drawn to the region because of the trail. They rent homes or stay in hotels, dine in restaurants and purchase food in grocery stores, bringing benefits to Sarasota County valued at $71 million. Also, many nearby Florida residents drive to and use the trail, and this will increase spending in local businesses. The desire to use the trail extension for walking, bicycling, and other recreational purposes will result in increased demand for property surrounding the trail. The attractiveness of living by the greenway corridor extension will result in increased property taxes of about $11 million and tourist taxes by $3 million for the county. Additional benefits will include improved health, a better environment, more recreational opportunities, and reduction in car commuting. I am including a link to a pdf file of figure 4, in case the one below is hard to read. The benefits of developing the existing rail corridor into a greenway trail could be even higher by investing in the right complementary infrastructure projects surrounding the Legacy Trail Extension. These might include an innovatively designed greenway along the 100-foot wide railroad corridor with attention paid to bicycle and pedestrian friendly connector roads and paths surrounding the trail. 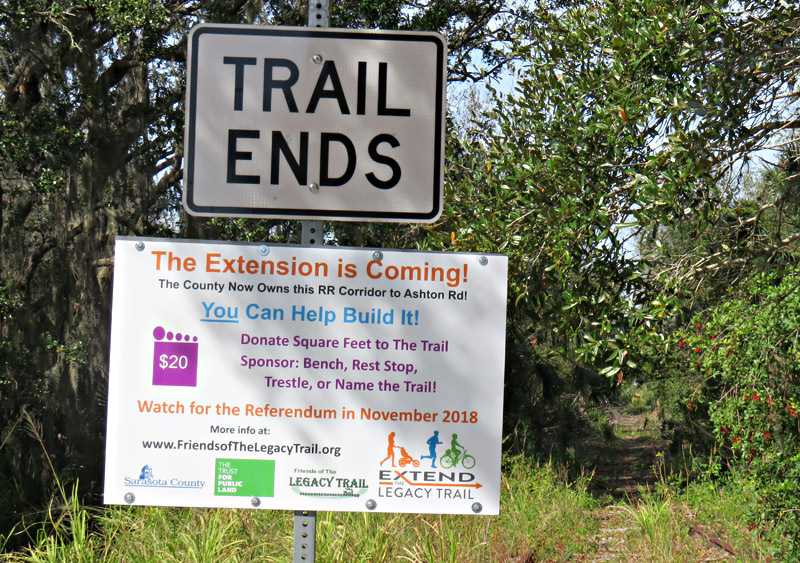 With the proper feeders in surrounding neighborhoods, the Legacy Trail Extension could, over time, connect previously cut-off neighborhoods in Sarasota County and transform the city’s downtown into a more pedestrian and bicycle friendly area. This, in turn, would facilitate the creation of new walkup business opportunities. 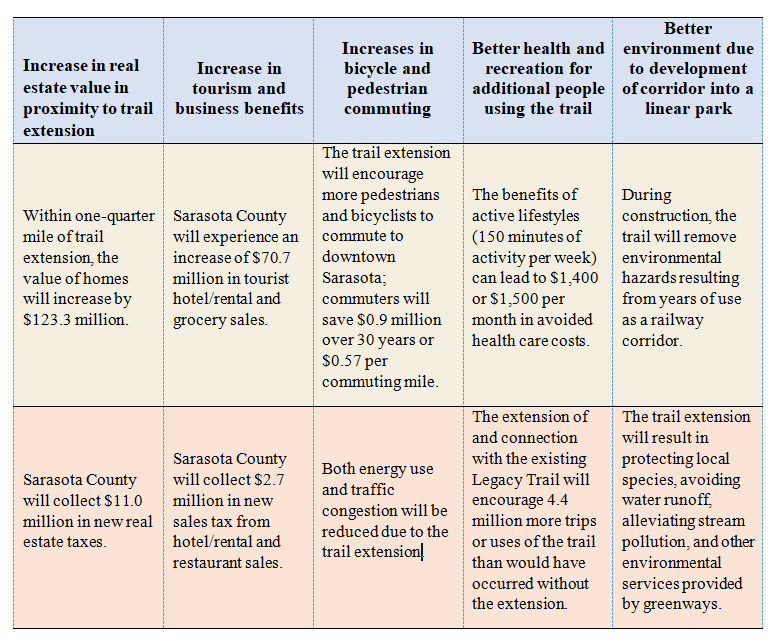 To conclude, the economic and social benefits of the trail extension without the complementary surrounding infrastructure are already quite high for Sarasota County. Complementing the trail with other bicycle and pedestrian friendly innovations would significantly increase the number of users and, as a result, the overall use and value of the Legacy Trail Extension for Sarasota. Using a similar logic, governments would never finance public parks, roads, recreational areas sports stadiums or other social infrastructure that promote local economic development and improvements in the quality of life. Governments do sometimes miss the mark investing in the wrong projects to improve local infrastructure. The bridges to nowhere are often cited as an example of wasteful government spending. However popular this phrase, for the majority of projects it simply means that hard to measure benefits are undercounted by skeptics of public investments. This perception that cyclists do not pay their fair share for improvements such as bicycle lanes and trails ignores the fact that bicyclists also pay taxes. They ride up to restaurants and other businesses and make purchases subject to sales tax. They pay increases in property taxes due to the increased value of homes that are near bicycle commuter routes or near popular near trails. They pay tourist taxes for staying in hotels or bed and breakfast lodging near popular cycle trails. Bicyclists also pay income and sales taxes which go to service the roads and transportation infrastructure for cars and trucks. The perception that motorists pay all of the freight for building roads is simply untrue. The problem is that all the costs for extending the Legacy Trail—a trail that will last 30 years or more—come at the beginning of the project. This means that the county government must come up with money over just a few years for a project that will provide extensive benefits for 30 years or more. The Sarasota County Commission's commitment towards working out a solution to finance the trail was discussed in a previous post documenting the previous deal for acquiring the rights to the railroad right of way. Showing support for the Legacy Trail Extension, in August 2017 the County Commision has come up with a new solution. The county council has allocated $7.9 million from existing budgets to get the project started. They will purchase a 2.7 mile segment of the project. The purchase and development of the remaining 6.3 miles will depend on a public vote on bond funding of $65 million in November 2018. This is a bit of a risk given that public votes for increasing taxes are unpopular. Before the bond referendum it will be necessary for non-governmental organizations that support the trail to actively raise money from other sources to lower the investments necessary by the county. They also must actively make the public case for the benefits of the Legacy Trail Extension for the entire population of Sarasota County. Regardless of the method of financing, the spending on the Legacy Trail Extension is a good investment for the Sarasota County. Even without a bond, the county will get back about half of its investment in the form of increased taxes resulting from rising property values, tourism and business sales. The conservatively estimated benefits will be close to 6 times the cost of the project, and they include increases in property value, higher numbers of healthy commuters and expanded tourism. Barnes, Douglas, 2018. The Value of the Legacy Trail Extension for Sarasota, Florida. 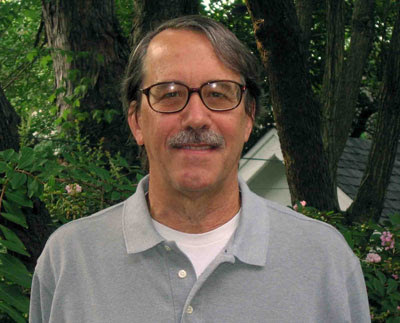 Report prepared for the Friends of the Legacy Trail, Energy for Development. Washington, DC. Cardno, Inc. 2014. Legacy Trail Extension Feasibility Study, Sarasota, Florida. Report prepared for the Sarasota County government and financed by Friends of the Legacy Trail, Sarasota, Florida. Normand, Roger, 2017. "LT Extension Supporters Celebrate Progress To Payne Park" Friends of Legacy Trail Website, Sarasota, Florida. Herald Tribune. 2017. "Smart plan to extend county’s Legacy Trail" Editorial in the Herald Tribune, August 29, 2017. As a homeowner whose backyard backs-up to the current rails, wasn't the previous seller (and/or his closing attorney) responsible to tell me (a visiting snowbird) that this was being looked at for future development of the current rail? Usually homeowners are required to disclose major changes such as this to prospective buyers. I am not sure if this is the case in Florida. There is much research that shows that neighbors worry before a trail is built, but they love them afterwards. They even build personal access to the trails. Also, research confirms that property values go up near trails. I hope this helps.